In honor of April being National Soyfoods month, I thought I’d focus this week’s posting on some of the health benefits and possible concerns of eating this bean. A lot of information has been published about soy, and it often seems like there’s conflicting advice as to whether it’s good or bad for us. Let’s try to sort out the confusion this week. So, what’s the deal with soy, anyway? Should we be eating it or not? The answer is that it really depends. Heart disease. In 1999, the Food and Drug Administration (FDA) granted food companies the ability to post a claim on their soy-protein-containing products, stating that, along with diets low in saturated fat and cholesterol, 25 grams of soy protein per day “may reduce the risk of heart disease.” Earlier studies indicated that soy protein did lower LDL, or “bad,” cholesterol. However, studies since then have pretty much refuted this claim: The American Heart Association has stated that soy doesn’t significantly lower cholesterol (reducing LDL maybe by about 3%). On the other hand, eating soy foods could be beneficial for lowering the risk of heart disease, as soy products are often used in place of animal protein foods, like fatty meats. Soy foods contain heart-healthy polyunsaturated fats, vitamins, minerals, and fiber. Menopausal symptoms. Soybeans are rich in isoflavones, which are a plant-version of estrogen called phytoestrogens. The thought has been that eating soy foods give an estrogen boost, thus reducing or relieving aggravating symptoms like hot flashes. However, not much evidence exists to show that this is the case. It may be that the isoflavones don’t pack enough of an estrogen punch to really provide symptom relief. On the other hand, when compared to a placebo, soy foods could provide some symptom relief for some women, although not as much as hormone replacement therapy. Breast cancer. Most breast cancers are what is called “estrogen receptor-positive” or “ER+.” There has been some concern, then, that eating soy foods, which contain those isoflavones (phytoestrogens), would stimulate the growth of breast cancer cells. But studies have shown that eating soy doesn’t increase the risk of developing breast cancer. In fact, an analysis of eight studies showed that those who consumed the most soy isoflavones were 29% less likely to get breast cancer than those not consuming as much. And in a study of women who survived breast cancer, eating soy foods was linked with a reduced rate of cancer reoccurrence. However, if you have or have had breast cancer, it’s best to check with your doctor about fitting soy foods into your diet. It’s also wise to focus on eating soy foods rather than taking, say, a soy isoflavone supplement. Prostate cancer. 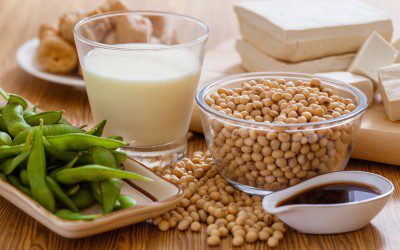 One type of soy isoflavone, called genistein, has been shown to prevent prostate cancer cell growth and enhance the ability of radiation to kill prostate cancer cells. In animal studies, rats who were fed a diet containing soy were less likely to develop prostate tumors; in those who did develop tumors, the cancer was less aggressive. In humans, studies also show that men who consume soy foods are less likely to develop prostate cancer, as well. The American Cancer Society encourages men to include soy foods in their diets to help lower their risk of prostate cancer. Besides heart disease and cancer, soy is thought to play a role in improving memory and cognition, along with bone health. However, at this time, there isn’t enough evidence available to confirm the role of soy for these conditions. Soy may have other health effects in the body. For example, people who have hypothyroidism may need to limit their intake of soy. Obviously, anyone with an allergy to soy should avoid it altogether. If you have concerns or questions about a particular health condition and eating soy products, talk with your doctor or dietitian. Remember that it’s best to stick with eating soy foods as opposed to taking supplements, which have not been well tested and may not be well regulated, either. In the meantime, including a serving or two of soy foods in your daily eating plan seems reasonable. 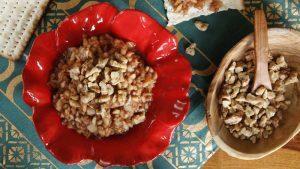 Here are some common soy foods to try. Remember to read labels for serving size and carb grams. Your dietitian can help you learn how to fit them into your eating plan to best meet your nutrient needs. What should you keep in mind as you’re checking out at the grocery store? Bookmark DiabetesSelfManagement.com and tune in tomorrow to find out from Regina Shirley, a registered dietitian living with Type 1 diabetes!